Baby Boomers (those born between 1946 and 1964) have found out some hard lessons recently about how easily their retirement money can disappear. One thing they may not have counted on is how much they may be taxed on Social Security benefits. Many adults receive social security as their only form of income. If that is the case, there income level would be low enough that they would not have to pay taxes or even file a tax form. See topic 423. Payroll Tax Cut Expires: How Much More Will You Pay? Typosquatting occurs when a website is created to prey on people who may have inadvertently typed in the wrong web address. An example would be arifrance instead of airfrance. Typosquatting is also referred to as URL hijacking, cybersquatting or brandjacking. USA Today reported that, “most typosquatting domains lead to a bot network, used to steal passwords and obtain personal information such as financial or banking records. Bot networks aren’t obvious and can involve millions of computers.” According to TGdaily.com, it is a good idea to get into the habit of bookmarking your favorite sites to be sure that you are landing on the correct page. Sixty Four percent of the typosquatted sites are US-based. Bendelman.org compiled a list of popular domains and their typosquatted sites to compare number of daily visitors. Click here for that report. With the New Year, people often make resolutions to fix problem financial situations. Part of cleaning an individual’s financial house includes taking a hard look at his or her credit. Credit Score Savvy (2003) was one of my earlier articles that I wrote for a local magazine. At that time, I was a loan officer and found that many people were confused by FICO scores and credit issues. In the article I explained factors that affected scores and the ability to finance a home. Although the market has changed since then, a lot has remained the same in terms of confusion about credit issues. A more recent article titled Polish up Your Credit includes some information about things people can do to improve his or her credit score now. 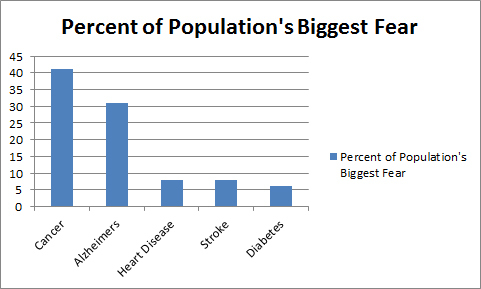 What may be most useful from this article are some of the statistics. The following chart provides answers to some of the most basic credit-related questions. Many consumers have taken a financial hit with the recent economic climate. 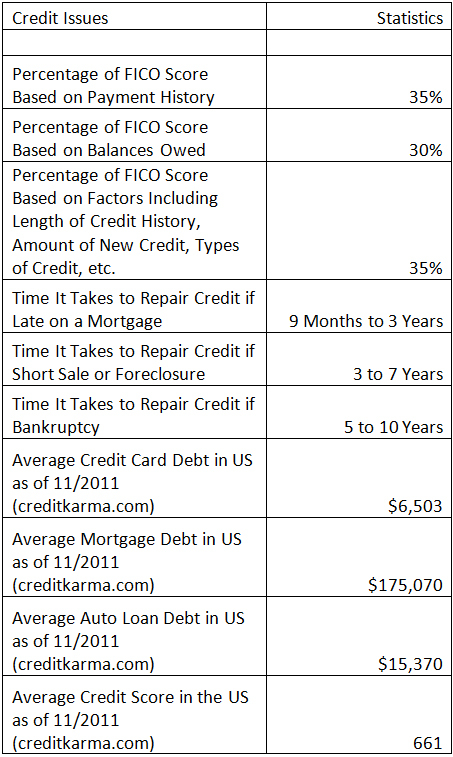 As more people are defaulting on their home loans, it is interesting to see the impact on FICO scores. The savvy homeowner that sees their home investment as a money pit, may go ahead and buy what they perceive as a better home purchase, perhaps a short sale, before they default on their original investment. In this way, they have good credit to purchase the new home before they take the hit to their credit score caused by the default of their original home purchase. Many people are going back to school to further their education in the hope of being more marketable in the workplace. As tuition increases, students may be wondering where their money is being used. Onlinecolleges.net reported 10 Telling Stats on Where Your Tuition Money Goes. It is interesting to note that the professor’s pay is not a big factor in these increases. It may be surprising how much goes to construction and renovations. Also of note is how much is being spent on entertainment. “Travel and entertainment are major expenses for universities. For example, Kansas State University spent $9 million in travel and entertainment related expenses in 2010.” For the complete list explaining where your funds are being spent, click here. Just the words Nuclear Meltdown can bring panic. The podcast “Stuff You Should Know” with Josh Clark and Chuck Bryant includes an excellent explanation of how nuclear meltdowns work. An interesting thing they point out in that podcast is that the earthquake was not as damaging as the tsunami that followed. For a written explanation of How Japan’s Nuclear Crisis Works, click here.